With timeshares at the Royal Gardens at Sunset Beach Club, you and your family will enjoy a beautiful vacation to Spain every year for more time in the sun, on the beaches, and to explore the history and culture of this incredible country. These Costa del Sol timeshare resales offer something for just about everyone to enjoy. On-site you can soak in the hot tub, bathe in the outdoor pool, or be pampered at the hair and beauty salon. While the adults relax, the kids can play with a Kid’s Club offering organized activities for all ages. Each evening, your dinner will be enlivened by special entertainment venues booked at the range of bars and restaurants, and you can sample local wines and dishes every night of the week depending on the season. If you are out to explore, the Golf and Leisure desk has several suggestions for day trips, car rental, and tee times. Spanish mountain villages, cities, and beautiful beaches are all on the list, although how you choose to craft your dream vacation will be up to you. Plus the multilingual staff always has helpful ideas for how to spend a full day at the beach. The Royal Gardens at Sunset Beach Club is just a short drive from the Benalmadena Marina and right on the Mediterranean, so you can certainly spend plenty of time on and alongside the water. All rooms and suites are elegant, air conditioned, and equipped with modern amenities including cable TV, stereo, and daily housekeeping for an added fee. 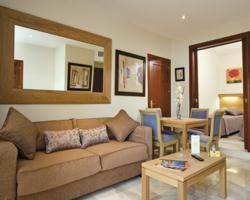 With these Costa del Sol timeshare resales, you can choose between studio rooms and one, two, or three bedroom suites. Studios make an excellent couple’s escape for two, while the suites accommodate up to four, six, and eight guests respectively. Suites also come with a full kitchen with stove, oven, refrigerator and microwave, as well as cooking utensils. 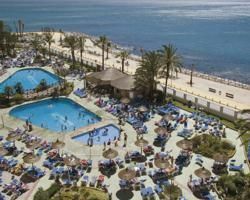 The many attractions of the Mediterranean coast of Spain, from beaches to castles, will be yours when you have a timeshare with Royal Gardens at Sunset Beach Club, a modern resort with all the comforts you could desire. Contact Royal Gardens at Sunset Beach Club Specialist Today!